While working as a research fellow at the Primate Research Institute at the University of Kyoto in Japan, French ethologist Jean-Baptiste Leca witnessed a sight that would prompt a toothy smile from any dentist. One day, a 14-year-old female Japanese macaque named Chonpe plucked a string of hair, stretched it taut between her hands, and ran the strand between her teeth. She was flossing. To a dentist, the moment was undoubtedly as breathlessly epic as a certain scene from Stanley Kubrick's 2001: A Space Odyssey. You might remember it. But macaques are not dentists. Though Chonpe continues to floss to this day, her fellow group members have not followed her example. But that's okay, because flossing isn't nearly as integral to oral health as your dentist would have you believe. There are a few things that you can count on during a trip to the dentist. One, your gums will be scrubbed massacred and left in tattered, bloody shreds. Two, your jaw will be sore from holding it rigidly agape for 30 minutes. And three, you'll be relentlessly badgered to floss your teeth. Despite the nagging, only between 10 and 40 percent of Americans stick floss between their molars, canines, and incisors on a regular basis. But according to the gathered scientific evidence, it doesn't seem like abstainers are missing out. While hundreds of flossing studies have been conducted, many are plagued by potential issues of researcher bias, as well as poor experimental design. In the past decade, three systematic reviews sought to navigate these muddy waters. The first, published in 2006, narrowed its focus to the effects of flossing in young children between the ages of four and thirteen. The reviewers found that children who had their teeth flossed by a professional hygienist five days per week for 1.7 years had a 40% decreased risk of cavities. However, those who were trained to floss and carried it out themselves did not enjoy any reduction. Since daily flossings by trained hygienists aren't available to the general public, the researchers admitted that their findings were limited. Furthermore, the children in the study were found to have poor tooth-brushing habits and a low exposure to fluoride -- the anion of the element fluorine known to prevent cavities. Thus, the authors noted that the evidence was unable to answer the critical question of whether flossing provides tangible benefits if one is already brushing with a fluoride toothpaste. Two years later, researchers at Inholland University for Applied Sciences in Amsterdam took up this query, reviewing the effects of flossing in addition to brushing on levels of plaque and gingivitis. What did they find? "A greater part of the studies did not show a benefit for floss on plaque and clinical parameters of gingivitis," they wrote. "Routine instruction to use floss is not supported by scientific evidence." A third review, published in 2012, reexamined the issue. Scientists collected and analyzed randomized controlled trials that compared the effects of tooth brushing and flossing with tooth brushing alone. Twelve studies, encompassing nearly 1,100 subjects were deemed suitable. Flossing was found to yield statistically significant reductions in levels of gingivitis and plaque buildup, however the reductions were miniscule, almost to the point of being unnoticeable. And in regard to reducing plaque, the authors deemed the evidence to be "weak" and "very unreliable." 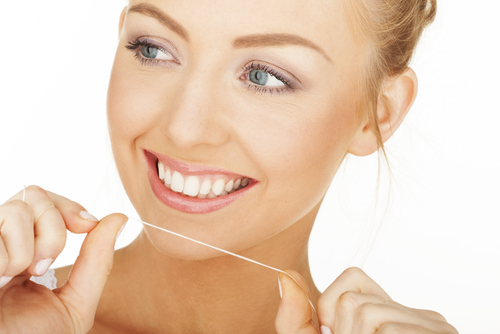 Overall, current scientific knowledge suggests that flossing simply isn't as vital as dentists make it out to be. Mouthwash may actually be a superior replacement. One plausible explanation for the dearth of supporting evidence for flossing is that we're all doing it incorrectly. Most flossers simply insert the string in between their teeth, yank out a few bits of food, and assume they're done. They're not. The American Dental Association recommends curving the floss into a "C" shape against the side of every tooth and firmly, but carefully, motioning it up and down.